Gann Swing Oscillator was introduced in the book "A W.D. Gann Treasure Discovered" by Robert Krausz. It is a range bound technical indicator that moves within +1 and -1. 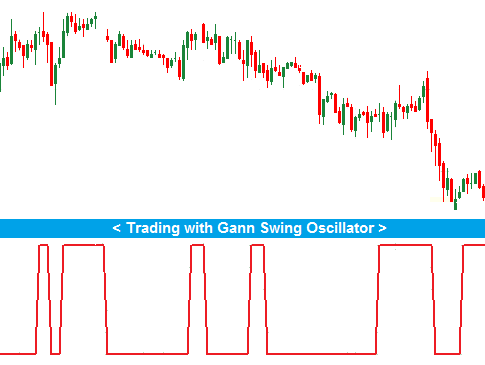 This indicator is meant to be applied with Gann HiLo Activator and Gann Trend Oscillator indicators, and these three indicators form a complete trading system called "New Gann Swing Chartist Plan"
Now the focus is on "How to apply Gann Swing Oscillator in forex trading"
The interpretation of this technical indicator is very simple as it is constructed. A +1 value of the oscillator suggests an up swing, and after an up swing a down swing is expected. A -1 value indicates a down swing, and after a down swing an up swing is expected. The indicator can only be effective ,if it is applied with other members of "New Gann Swing Chartist Plan". The indicator alone is not sufficient in taking a trading decision.